It has been known for some time that various substrains of BALB/c, while all originally derived from the same breeding stock, differ phenotypically and at several distinct genetic loci (Potter this volume). In particular, a single difference has been described in the MHC locus on chromosome 17. BALB/cJ mice and all sublines derived from them are Qa2a, that is, they express the epitope identified by B6.K1 anti B6 antiserum. 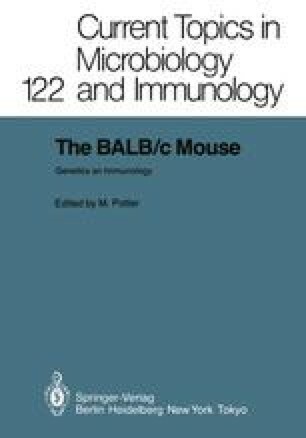 BALB/cAn mice and most sublines derived from them are Qa2b and do not express the epitope (Forman 1978). Recently, a single 3.7 kilobase (KB) XbaI restriction fragment has ben identified that distinguishes these two BALB/c sublines, and convincing evidence has been presented that this correlates with Qa2 phenotype. In fact, it seems likely that the fragment is part of the gene encoding the Qa2 molecule (Flaherty 1985).